I'm writing an add-in for Joomla and I have a question about modules. I'll be the first to admit I'm not a wizard on Joomla. I have read a bit and watched some tutorial videos. Say I have a module that displays a mini-calendar. Can I have the mini-calendar display data from one set, while on a different page, the same mini-calendar module displays data from another set? In WordPress, when you drag a widget into an area, you can specify the settings for the widget, in that specific area. You can even drag the same widget into a specific area multiple times and specify different operating parameters for each widget instance. Is there something analogous in Joomla? If modules aren't the way to go, could anyone please give me a pointer on the direction I should go? Yes, you would simply need to include a field for the ICS calendar feed in your module. Each instance of the module could have a different value there. Yes, but not using "drag-n-drop." You would simply create a new module of the same "Type" and assign it to the same module "Position" for each instance of the module you want. You can even choose the "Ordering" of the modules in the same position. Yes, it sound like modules are absolutely the way to go! Hi George and Welcome to JSE! A module sounds like a reasonable solution for your scenario. Parameters can be included in the module to make it easy for users to choose what information to display in each instance of the module that is created. 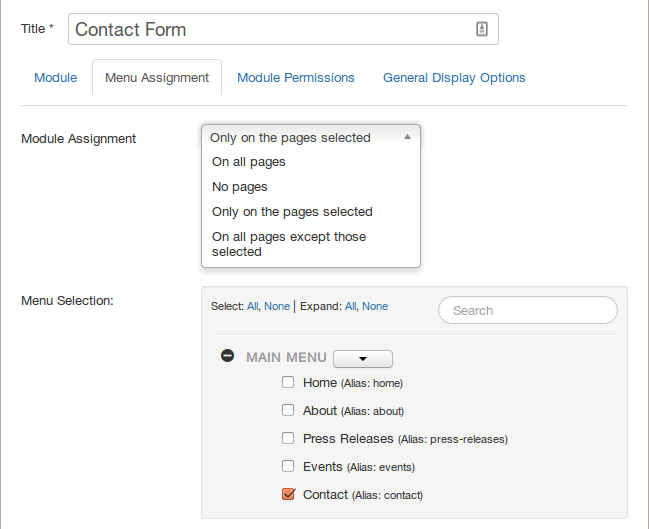 Modules can then be individually assigned to pages as required such as "On all pages", "Only on the pages selected" or "On all pages except those selected" etc as per the example below. Not the answer you're looking for? Browse other questions tagged joomla-3.x development module-params or ask your own question. Set Prefered Template with parent:display()?